OURTY Tactical Self Defense Pen is made of aircraft aluminum, which is lightweight for EDC (Every Day Carry). It is 6 3/8 inches(16cm) long with a stiff clip that can easily hook onto your pocket or backpack. Gift Boxed. Comes with 2 ink cartridges and 3 sets of batteries(9 pcs LR936 cells in total). ▶ EDC Multi Tool: Use as bottle opener(open beer bottles or bottles alike), hex wrench, screwdriver, polisher and also comes with a serrated edge. ▶ Easy to Carry: The overall length is 6 3/8 inches(16cm), weighs only 1.5 ounces (43g). It has a stiff clip that can easily hook onto your pocket or any MOLLE straps. ▶ Emergency Saver: The tungsten steel glass breaker tip is solid enough to break 10mm window glass when you get trapped. ▶ 12 Lumen LED Flashlight: Emergency light that can last for 10 hours. 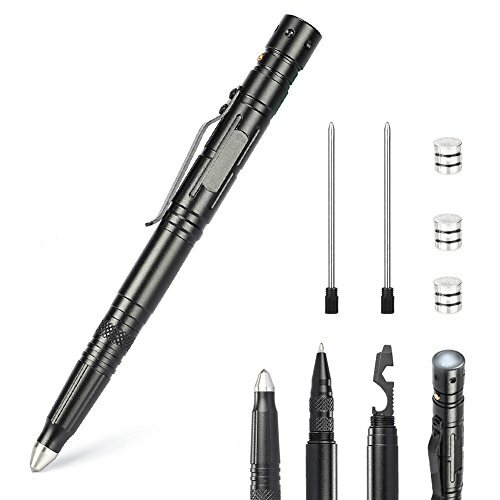 The flashlight adopts 3 LR936 battery cells to work, each pen comes with 3 sets of batteries (9 pcs cells in total). ▶ Black ballpoint pen for daily smooth writing, 2 ink cartridges are included. If you have any questions about this product by Outry, contact us by completing and submitting the form below. If you are looking for a specif part number, please include it with your message.